The U.S. government pulled no punches in announcing plans to have Huawei executive Meng Wanzhou extradited from Canada to face charges ranging from stealing trade secrets to bank fraud to money laundering. The Jan. 28 announcement was made by top-level officials—the intention obviously being to send a strong message to Beijing. The Department of Justice unsealed two indictments against Meng, Chinese telecom giant Huawei, and two of its subsidiaries in a pair of legal cases accusing the company of circumventing sanctions against Iran and stealing trade secrets from U.S. mobile carrier T-Mobile. In the T-Mobile case, prosecutors allege that not only did Huawei employees try to steal the design of a robot named “Tappy,” but stealing technology from competitors was encouraged by Huawei managers and there was even a bonus program to reward employees who stole trade secrets. The accusation is part of a 10-count indictment accusing Huawei of stealing trade secrets, committing wire fraud, money laundering, and obstructing justice. In a separate 13-count indictment, the DOJ said Huawei misled a global bank and U.S. authorities about its relationship with Hong Kong firm Skycom Tech—which was, in fact, an unofficial subsidiary of Huawei that conducted business in Iran. “Both sets of charges expose Huawei’s brazen and persistent actions to exploit American companies and financial institutions and threaten the free and fair global marketplace,” FBI Director Christopher Wray said at a press conference in Washington announcing the charges. In the 13-count indictment, the DOJ revealed the charges that triggered Meng’s arrest in Vancouver last December. Prosecutors accuse Huawei of a long-running scheme, which started in 2007, to deceive numerous global banks and the U.S. government regarding the company’s business activities in Iran, a DOJ press release stated. 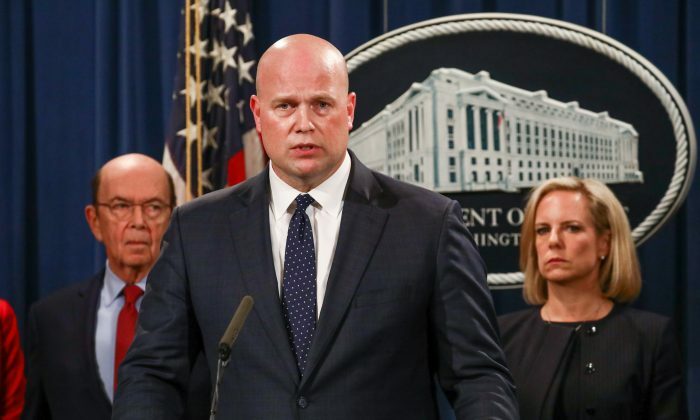 “Criminals and bad actors can be certain that they will not get away with criminal activity,” acting Attorney-General Matthew Whitaker said at the press conference. The daughter of Huawei founder and CEO Ren Zhengfei, Meng is currently out on bail and living in one of her two mansions in Vancouver. Canada’s Justice Department said it received a formal extradition request on Jan. 28. Meng is specifically accused of making a presentation in August 2013 to a bank executive, in which she repeatedly lied about Huawei’s relationship with Skycom, according to the DOJ release. The charges add heat to the scrutiny Huawei already faces in the West over allegations that its products could be exploited by Beijing for spying—an allegation the company has repeatedly denied. U.S. Commerce Secretary Wilbur Ross said the Trump administration is cracking down on those who violate trade sanctions.